Pommies Caramel Apple Nachos » Pommies Cider Co.
Superbowl Sunday is here, and we have the perfect snack for your guests. Enjoy our Pommies Caramel Apple Nachos! In a microwave, melt caramels with Pommies Farmhouse Cider. Stir until smooth. In a large pan, melt the marshmallows and cubed butter. Lay apple slices on a large plate/platter. 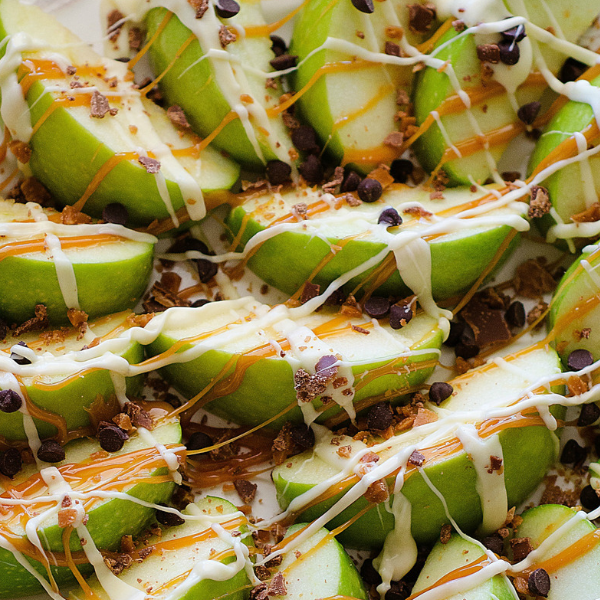 Drizzle caramel over apples. Add marshmallow and butter blend. Chop Skor bar into small chunks and sprinkle over apples. Then sprinkle the chocolate chips. Add a light layer of cinnamon on top for taste.